Salt shakers with fewer holes have been sent to fish and chip shops in an attempt to curb salt consumption. West Norfolk Council spent about £450 sending 200 shakers, which have only four holes, to 39 shops in the area. 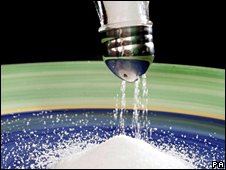 It said it hoped the scheme would help residents limit their salt intake to the guideline maximum of 6g a day. A spokesman for the National Federation of Fish Friers called the scheme a "gimmick" and said customers would just shake the containers more. Graham Adderson, 62, who owns the Downham Fryer, in Downham Market, said: "I think the scheme is hilarious. "If you want to put salt on your fish and chips and there are only four holes, you're just going to spend longer putting more on." Mr Adderson was given three new salt shakers on Tuesday and said he has not noticed any difference so far. His son, Daniel, 25, who also works in the shop, said: "I can't see the scheme working very well. "Most people probably put more on when they get home - I think the whole idea is a bit of a waste of money to be honest." The council said the initiative was inspired by a national campaign by the Food Standards Agency aimed at reducing salt intake. David Harwood, of West Norfolk Council, said: "Health professionals suggest that we should limit our salt intake to 6g a day, but estimate that most people consume approximately 9g. "We hope that the simple measures of the salt shakers will help people to make a small change that could make a real difference to their health in the long term."